Automotive oil in your bike? This topic comes up so often, and while I was at Wal-Mart (seems like the only place I can find the oil I use) yesterday, I took a few pictures to show how to determine which is OK to use. Here are two bottles of oil - both are very high quality Mobil 1 full synthetic. 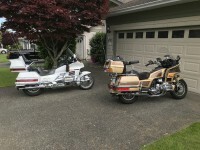 The one on the left, the 10W-40 "High Mileage" is what I have used with great success in my GL1500 for many years. It smooths transmission shifts, and keeps the engine quite clean. Looking at the API badge, this 5W-20 oil shows "Resource Conserving" in the bottom half of the badge. Any oil that says "Energy Saving", "Resource Conserving", or something of the sort in the bottom half of this circle has friction modifiers - which is unacceptable for use in a motorcycle with a wet clutch. It will cause clutch slippage, and can lead to damage. This is the 10W-40 oil that I use. Notice that there is nothing in the bottom half of the label, which indicates that this oil does NOT contain friction modifiers. Interesting that SF oil hasn't been specified in vehicles for the most part since 1988, and SG oil since 1993, yet it is still specified as standard for my 2000 model year GL1500! The ratings are backwards-compatible. So if your bike's manual says to use SG oil, you are good to use SG, SH, SM, SZ...basically anything coming after SG will work great (actually better) than the obsolete SG oil. Re: Automotive oil in your bike? And the Shell Rotella T-6 full synthetic is rated JASO MA for wet clutches. I buy it on sale for less than $20 per gallon. 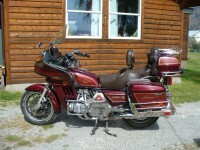 So........how about a "vintage" ride like my '83 GL1100A....?? Would you suggest this oil for that also...? Your GL1100 is also specified to use 10W-40 oil, just like the GL1500. Mechanically, there are not a huge number of differences in the engine - same type of clutch, gearbox, oil sumps, everything. I personally used this exact same oil in my 1982 GL1100 Aspencade with the same excellent results. I've been using Delo 400 SDE SAE 15W-40 in my 2005 GL1800A. In the bottom of the circle is "CL-4 Plus." Is this a friction modifier? 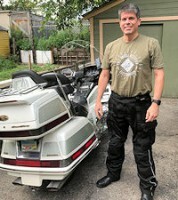 I've been using Castrol GTX 10-40 exclusively since buying my 1983 Gold Wing Interstate in 1983. Just had a look at the label and it is Resource Conserving! I've read a few threads where it says not to go to synthetics on older bikes as it may cause leaks. It has about 67,000 miles on it. Anyone switch over to synthetics on a vintage bike with this many miles? Am I asking for trouble? I do use Mobil 1 synthetic in all my families cars. I've been using synthetic oil in my 1983 GL1100 since I purchased it 5 years ago. Never had an issue with leaks and yes the trans does shift better. I'm using AMSOIL bike specific oil which is rather expensive but I can go the whole season without changing, or needing to add, regardless of mileage and then do a fresh change right before I put it in storage for the winter. Actually purchased my GL1100 8 years ago. I also have done the alternator conversion on my bike with great results. How is your charging system holding up? I used road rogue's general idea but made some changes that I felt were better for me. I like the idea of synthetic oil and will likely switch next season if my research doesn't convince me otherwise. Charging system still original and no problems. I switched to 5w30 because I wanted a thinner oil at startup times. The 01-05 GL1800s have a potential Alternator Drive Gear that can shear if treated harshly when just starting up.... I never, ever, touch the throttle until after the engine is warm. Break the ADG, and the 1800 engine is toast. I run 15w40 in all my wings for years. This article on oil and test results has really made me think about what I know about oil for my MC. The topic of the JASO standard also gets mentioned from time to time as well. The JASO standard came out in 1999. There is the JASO MA and MA2 standard. The JASO standard basically states that there are no friction/energy conserving additives in the oil and it is good for wet clutch applications. The difference between JASO MA and MA2 standards is that JASO MA2 standard is suitable for engines that have catalytic converters. If you don't have a catalytic converter either standard is good. If your bike was manufactured before 1999, any high quality, high detergent oil without any energy conserving/friction modifier additives that meet the oil standard as detailed in your owner's manual is acceptable.